Tickets are only available at HK Ticketing booking hotline and website. 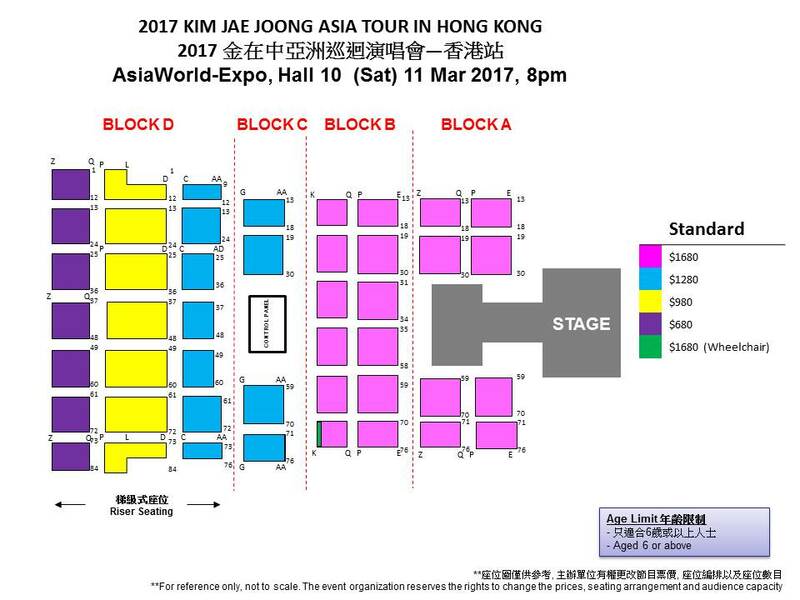 After 26 January 2017, unsold tickets are also available at all HK Ticketing outlets. ※ Tickets available at HK Ticketing via Internet & Hotline Booking ONLY on 1st public on sale day (January 26, 2017, 10AM onwards). ※ Maximum of 6 tickets are allowed to purchase per transaction on 1st public on sale day. For aged 6 or above. Regardless of age, each ticket admits one person only. A valid ticket must be presented for admission. Regardless of price, maximum of 6 tickets are allowed to purchase per transaction on 1st public on sale day. To avoid delays in entering the venue and to ensure an enjoyable experience, all ticket purchasers are recommended to pick up their tickets at any HK Ticketing’s outlets prior to the show day. Bag search / security check will be conducted before entering AsiaWorld-Expo, Hall 10. All cameras with interchangeable lenses, video and voice recorders are not allowed inside AsiaWorld-Expo, Hall 10. Unauthorised photography, filming and recording is prohibited at AsiaWorld-Expo. All glass bottles are not allowed inside AsiaWorld-Expo, Hall 10. Bags / articles of size over 12″ X 15″ or restricted items including stools / folded chairs / long umbrella / selfie sticks are not allowed in the standing zone. Please check-in the restricted article(s) at the Concierge (HK$25 per 4 hours per item) on Ground Level or Lockers (HK$30 per 4 hours) on Ground Level.